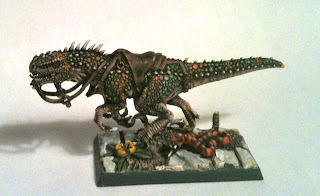 I am signed up for the Buckeye Battles tournament in Ohio this coming July, and am planning on taking Lizardmen. Although they are not the most optimal choice, I want to bring a unit of Saurus Cavalry. 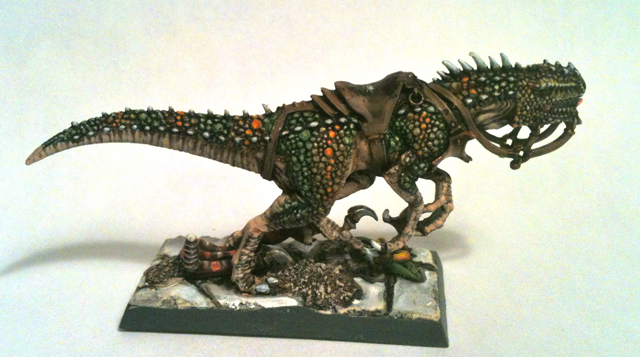 Rather than using the current range, I am combining Dark Elf Cold Ones with old metal Saurus Cavalry Riders. This is my prototype Cold One. I'm planning on bringing a unit of 8, including a heavily converted Scar Veteran Battle Standard Bearer.